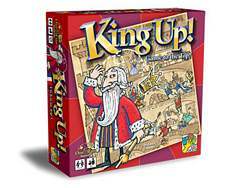 game to the top - who is the next king ? The enlightened monarch, Vladimiro Miritiro, has grown tired of reigning. He has chosen to hand off his crown, but who will be his worthy successor? Paladins, cooks, painters, and all the other subjects bustle about, seeking the throne in a whirling vortex of intrigue and subterfuge. Only one of the wacky subjects can be the next king!